... and Experience: Relevant qualification. 4 years’ experience in a supervisor role. Experience in an HVAC, plumbing or construction industry role ideal. Competitive Salary Job ID: 1002400P Skills ... and Experience: Relevant qualification. 4 years’ experience in a supervisor role. Experience in an HVAC, plumbing or construction industry role ideal. Companies presently offering Plumber job vacancies in Cape Town City Centre include AVI, .. The standard deviation of salaries for the results of this search is 157,000. 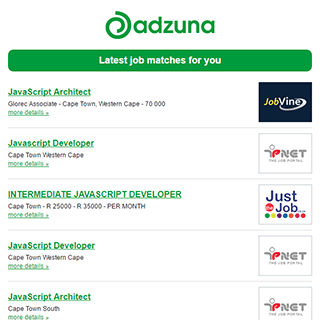 The Adzuna recency index score for this search is 1.56, suggesting that demand for Plumber job vacancies in Cape Town City Centre is increasing. Get the latest Plumber Jobs in Cape Town City Centre delivered straight to your inbox!